Joyous feast! 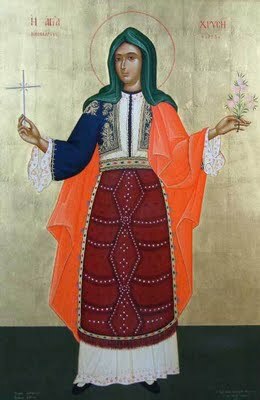 St. Chryse the Virgin-Martyr (more commonly known as Zlata) was born in the region between what today are Bulgaria and Serbia during the Turkish Yoke. The Saint possessed a strong character and deep faith, but drew the attention of a Turk because of her great beauty. Having kidnapped her, the Turk attempted to seduce the virgin and convert her to Islam, turning from seduction to threats when St. Chryse remained firm in her faith. St. Chryse endured six months of threats in the Turk's household. Seeing that his threats had no effect on the Saint, the Turk turned on her family and threatened to murder her and torture them if they did not persuade her to accept Islam. Despite their appeals to convert for appearance's sake, however, St. Chryse remained steadfast in the Orthodox Faith and endured three months of tortures, being beaten and having her skin peeled off her body by her tormenters. At the last St. Chryse was tied to a tree by the Turks and cut into pieces, her precious relics later being recovered by the area's Christians and buried with reverence. She witnessed to the Orthodox Faith in 1795. May her blessing and prayers be with us all! More on St. Chryse's life can be found here.